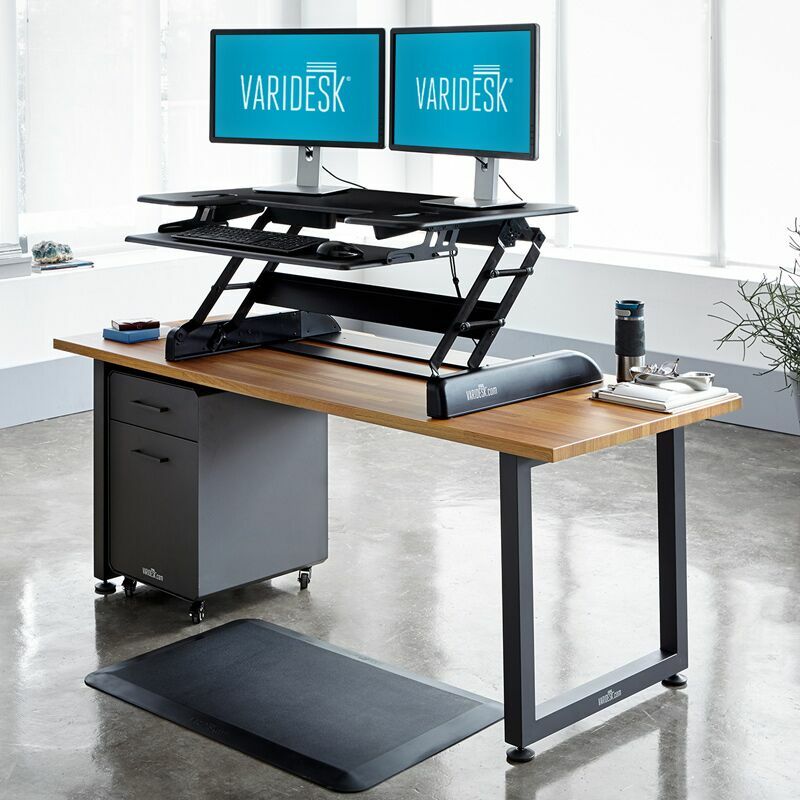 Varidesk Exec 40 Review – The Rolls Royce of Standing Desks! About 5 years ago, a personal training client of mine told me he’d got himself an adjustable standing desk. He was a TV editor working on some big name TV shows (you’d DEFINITELY have heard of them!) and the long hours sitting down were doing his back no good. He had his desk installed in Media City and said it made a huge difference to his back problems. Within a few weeks they’d gone, he noticed an improvement in his energy levels. At the time I thought it sounded good, but I didn’t do enough desk work to justify picking up a standing desk. I thought perhaps a lectern may work, but they just don’t look that good and aren’t as practical, so I left it. Varidesk Exec 40 Review Opportunity! Fast forward a few years and I’m sat down a lot more. I’m still personal training obviously, but now I also have an online training platform, so I’m doing so much more desk work. Although I love my office, a standing desk would have been a very welcome addition! When I was offered the chance to take a Varidesk Exec 40, I grabbed it with both hands. I’d heard they were great and now was my chance to test it. First impressions were great – the box is huge and heavy. When you open it up, there are very clear instructions, so setting it up is a doddle. The build quality is fantastic. The desk is super easy to adjust, doesn’t wobble at all and is really, really strong. All of the joints, the surfaces and the frame are rock solid, which is something that can’t always be said for office furniture. The Varidesk sets the tone for quality from the second you get it out of the box. The desk is adjusted by two handles – one either side of the desk. You gently pull the handles and adjust the desk up or down depending on the height you require. You can even drop it lower so you can sit at the desk if you prefer a break from being on your feet! It’s very heavy because of the quality of construction. Make sure your table top is strong enough to support it. It’ll snap a flimsy table like a twig! The Varidesk Exec 40 is big, so won’t suit small offices. Make sure you can fit the desk in and still have room around. Due to the weight, make sure you have someone around to help you lift it into position. This is a high quality product. It’s well-made, easy to use and super functional. It’s hugely adjustable so will suit all kinds of people, shapes and sizes. 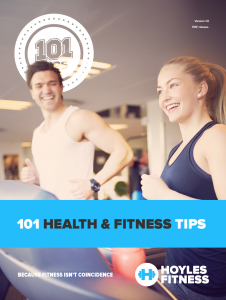 It lets you get off your backside, helping with alertness, fighting fatigue and easing back issues. 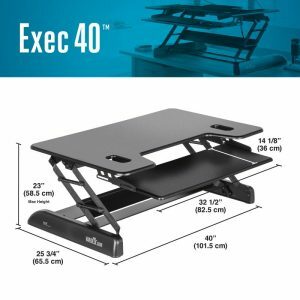 If you do a lot of desk based work, you’d do a lot worse than buying yourself a Varidesk Exec 40. It could be the best decision you ever make for your productivity at work!